However, when I try this, it says that it cannot execute my scripts, and hence I get the following error: SecurityError and the Fully Qualified Id is : UnAuthorizedAccess. 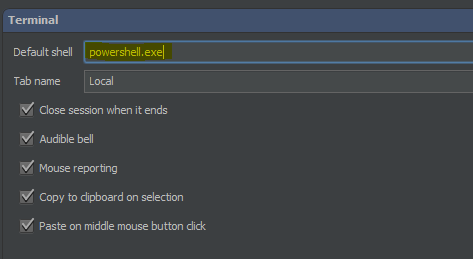 This arises from the fact that pycharm's terminal cannot execute my Powershell_profile.ps1 profile file. 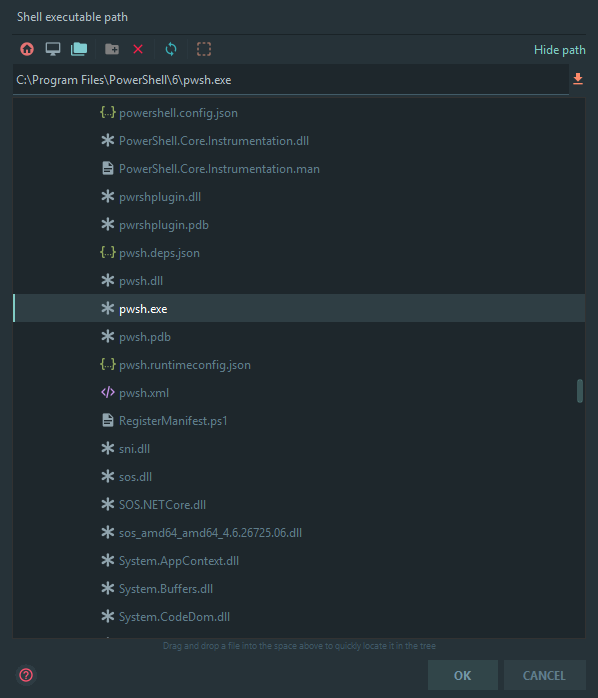 How can I successfully run Pycharm's terminal with Powershell? However, this does not help, and I get the same error when I try to open of pycharm's terminal. I have also tried to run pycharm as Admin, however this does not solve the problem either, and I get the same aforementioned error. I've replaced cmd.exe with powershell.exe in a simpler way and hope it can help. I'm using webstorm2017 and Win10 os. 1.Find the exact location of powershell.exe.In mine and I believe in most computers the location would be C:\Windows\System32\WindowsPowerShell\v1.0\powershell.exe.Copy the whole path into your clipboard. 2.In your IDE open File=>Setting=>Tools=>Terminal, and paste the path into "Shell path" blank. 3.Restart the IDE and everything would be ok.
Browse to the PowerShell executable, right-click, run as administrator. Once that is done, close PowerShell, and attempt to use it again from your application. Opened a powershell instance in Admin mode. Restarted IntelliJ and the issue was solved. Step 3 is from ebelanger's answer. If you're running on Windows 8 x64 then running both the commands below may help. It worked for me. Note that Unrestricted level is the least secure of all, and you're usually can go with RemoteSigned in order to disable unsigned scripts downloaded from the web until you manually remove Internet or Intranet Zone.Identifier from them, usually with Unlock button in file properties. Set-ExecutionPolicy : Windows PowerShell updated your execution policy successfully, but the setting is overridden by a policy defined at a more specific scope. Due to the override, your shell will retain its current effective execution policy of AllSigned. Type "Get-ExecutionPolicy -List" to view your execution policy settings. For more information please see "Get-Help Set-ExecutionPolicy". The file [script path] is published by CN=PowerShell User. This publisher is not trusted on your system. Only run scripts from trusted publishers. Answer A to always run self-signed certificates. Now your profile script won't cause any errors. However, note that signing a certificate adds a signature block in the end of your script containing its hash. If you're about to modify the script, remove that block and, after you're done with editing the script, sign it again by repeating step 3. 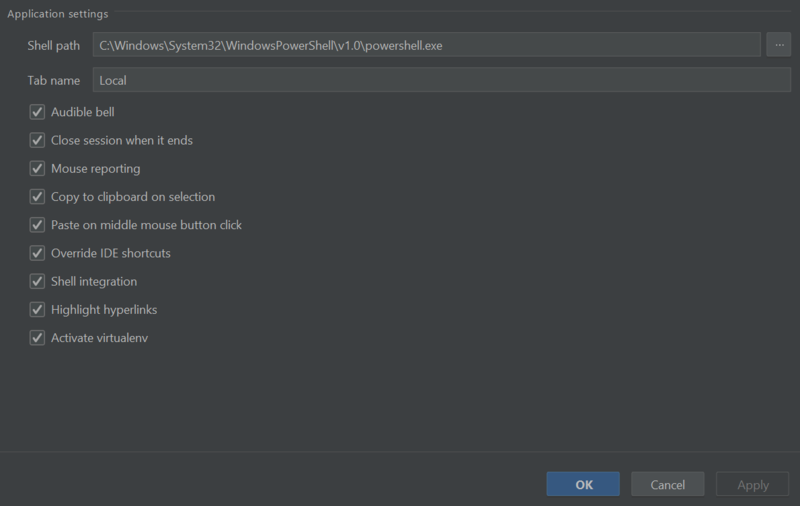 For WebStorm and PowerShell 6+ on Windows 10. Just follow this screenshot and change the default cmd.exe to pwsh.exe from settings. Finally restart the ide. Done! As of this writing (2018-9-20), there is now a PowerShell plugin available here. I have installed v1.1 in PyCharm v2018.2.3 (Professional), and it seems to work like a charm, no pun intended. There appears to be no need to muck about with any kinds of settings or permissions in order to get it to work. It Just Works. Not the answer you're looking for? Browse other questions tagged powershell intellij-idea pycharm or ask your own question. How to see JavaDoc in IntelliJ IDEA? Can IntelliJ IDEA encapsulate all of the functionality of WebStorm and PHPStorm through plugins?